We offer wide range of Hemoglobin Meter With finger touch zero setting, Memory for the storage of samples, 1 ml solution measurement. Power 230 V + 10 % AC, 50 Hz. 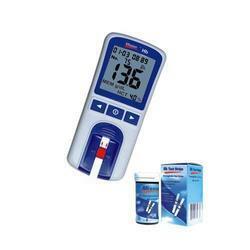 Digital Hemoglobin Meter offered comes with bright and large LCD display support that makes the system easy to handle. Also coming with soft touch keys and auto calibration support this high performance based digital Hemoglobin meter delivers fast & accurate monitoring of hemoglobin. We make the system available under model LT – 113 with digital display of 3½ Digit, Bright LED, zero adjustments automatic (without Knob rotation) and working accuracy of + 0.02 O.D. Portable and high-performance digital Hemoglobin Meter require the fully automated process. This provides easy, fast & very accurate monitoring of hemoglobin. In this the adjustment or calibration is not needed and ensures to provide results within 15 seconds. Immediate testing for Haemoglobin and Haematocrit from the finger prick whole blood.